A glance at a topographical map of Turkey reveals that this is a country of mountains. Rising from all four directions, mountains encircle the peninsula of Anatolia. A part of the Alpine -Himalayan Mountain range, Turkey has mountainous regions with different geological formations. The North Anatolian range skirts the Mediterranean shore. 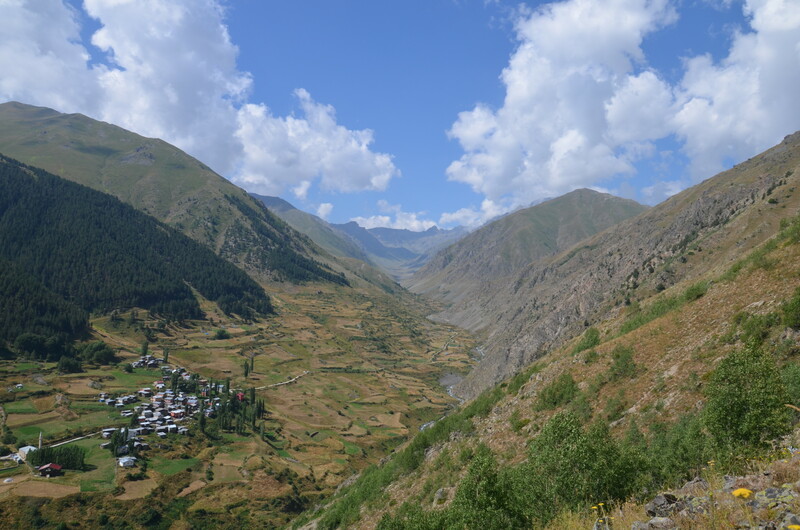 The mountainous nature of the country has influenced its cultural evolution. For centuries, nomads and semi nomadic peoples have moved yearly to the fresh pastures of the higher elevations in the summer. These alpine meadows, called “yayla”, house nomadic people whose traditional culture is still preserved. For climbers and those interested in the geography of mountains, Turkey offers a wealth of exploration. Glaciers, volcanoes, and peculiar geological formations such as karst prove irresistible to researchers and students of the geology. The challenging terrain offers opportunities to aficionados of outdoor sports, who find the most interesting experiences on the mountains of eastern Turkey. Standing the nearby cities of Agri and Igdir, at the borders of Turkey and Iran, Mount Ararat is an inactive volcano capped year round with ice and snow and rises to 5.137 meters. The Old Testament records that it was on this mountain that Noah’s Ark came to rest after the great flood. Southwest of the mountain, the Little Mount Ararat reaches up to 3.896 meters; the Serdarbulak lava plateau (2.600 m) stretches out between the two pinnacles. Climbing the spectacular Ararat is a challenging and rewarding experience. In the summer, the weather in the area and on Mount Ararat is sunny, warm and dry. However, in the winter and spring, cold and harsh conditions prevail, and mountain climbers occasionally face blizzards and turbulent weather. July, August, and September are the months when most world mountain climbers come to the area. Climbing up Ararat is most enjoyable during this period. The area surrounding Mount Ararat has retained its natural beauty. The local population still engages in a traditional life styles. In the summer months the villagers move to the “yayla”, the summer pastures, to find fresh grazing for their herds of sheep, goats, cattle and horses. Women continue to weave carpets and kilims in time honored designs. Mount Süphan, a magnificent dormant volcano rises from the north – west shores of Lake Van. Throughout the winter, snow falls on Süphan reaching three to four meters. The mountain’s steep slopes and snow blanket combine to make it a good location for “Heli – skiing”, using helicopters to drop you off on the slopes for an adventure of high mountain skiing. An inactive volcano, Mt. Nemrut nearby Tatvan ascends to 3.050 m. Mt. Nemrut is the most southern and youngest of the chain of volcanoes in the eastern Anatolia. A strato type volcano, Mt. Nemrut began erupting during the fourth geological era and continued to be active until 1441 A.D. Mt. Nemrut is bare of vegetation, except in the south which has oak groves and birch trees. Summer (June – September) is the best season for expeditions in Mt. Nemrut. Hikers who climb to the crater and summit from the southeast or eastern face of the mountain are rewarded with wonderful views of Lake Van. In the rainy and lush landscapes of northeastern Turkey, the Kaçkar mountains form the northern section of the Anatolian mountain chain. The Kaçkar rise in between the shores of the Black Sea to the north and the River Coruh valley to the south The Kaçkar – Kavron summit, at an altitude of 3.932 meters, is the highest point in the range. Extensive glacier and water erosion have given these mountains their craggy, rugged look, and they are known for the complexity and power of the streams and rivers which rush down to the lower altitudes.